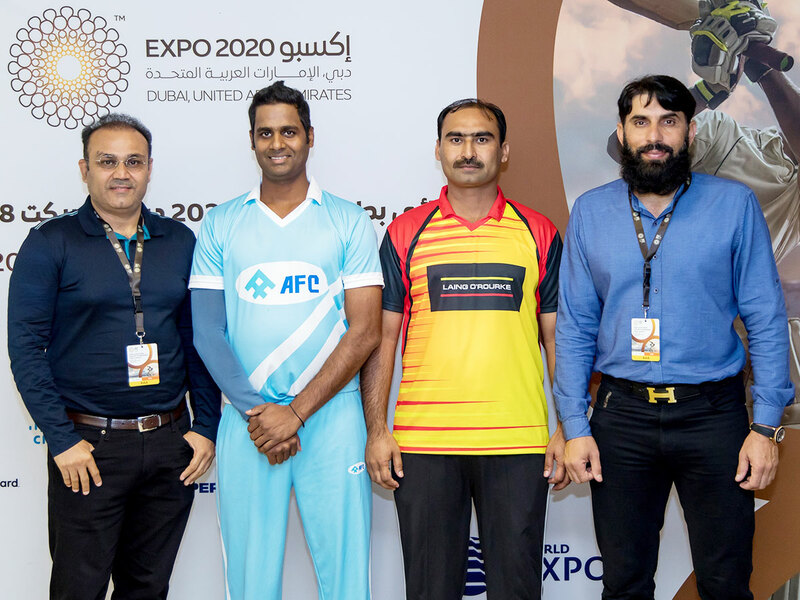 Dubai: Expo site workers got the chance to be mentored by their cricketing heroes Misbah-ul-Haq and Virender Sehwag in the Expo 2020 Dubai Cricket Tournament final at Dubai International Stadium in Dubai Sports City on Thursday. Misbah led Pakistan to 26 Test wins, making him the country’s most successful captain, while Sehwag, who was widely considered to be one of the best batsmen of all time, secured multiple records while playing for India, including the fastest triple century in the history of international cricket. Both were on hand to present awards for best bowler and best batsman, but they also gave Expo 2020 workers some expert advise ahead of their big game. Thirty-two teams of Expo site workers had been competing for the last three months to make this final and were keen to impress their idols in the stands. The second annual event forms part of Expo 2020 Dubai’s commitment to advance worker welfare. “Cricket is a passion for many of the people working at Expo 2020, so this competition offers a fun and exciting way to celebrate their ongoing efforts to deliver our 4.38-sqkm site safely, securely and effectively,” said Dr Rob Cooling, vice-president of Health, Safety and Environment, Real Estate and Delivery, Expo 2020 Dubai. “We were delighted to be joined by Misbah-ul-Haq and Virender Sehwag, who are sporting heroes to millions of people around the world — not least this year’s finalists,” he added. A total of 10 main contractors and approximately 200 subcontractors are currently collaborating to build the World Expo, and about 40,000 workers are expected to be active on the Expo 2020 site during peak construction. More than 60 million work hours have already been completed, and this figure is expected to rise to about 130 million by the time construction is completed. Expo 2020 expects to attract 25 million visits between October 20, 2020 and April 10, 2021, and 70 per cent of its visitors are projected to come from outside the UAE — the largest proportion of international visitors in the 168-year history of World Expos. More than 200 participants, including countries, corporations, multinational organisations and educational institutions, will come together for the six-month celebration of human ingenuity and progress, bringing to life Expo 2020’s theme of ‘Connecting Minds, Creating the Future’.